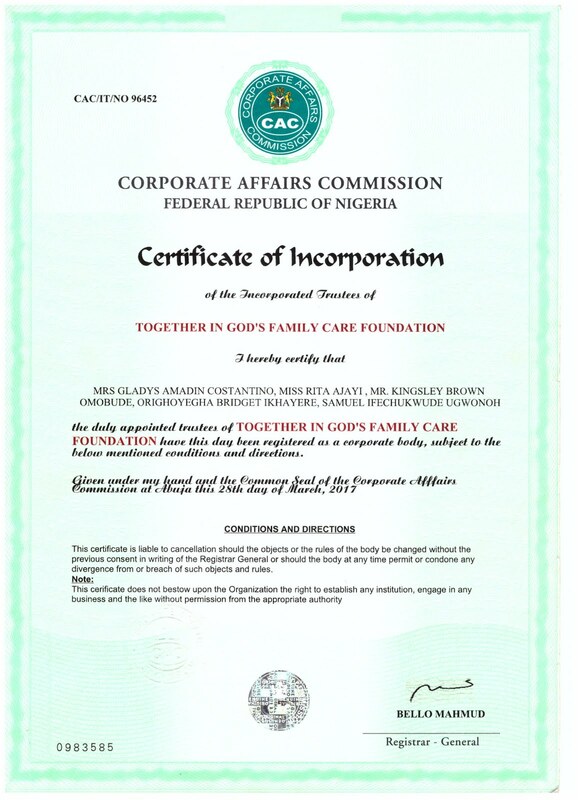 Together in god's family care foundation it is a humanitarian network a nongovernmental organization where assistance support and fight for human right and the less privileged its our core vision for existence. 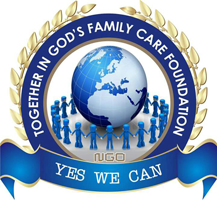 The "Together In God's Family Care Foundation" has engaged in social activities, such as the distribution of notebooks to write for school children in a village and in Nigerian cities; financial support of pregnant women who could not afford health care, as in many African countries Health is private; donation of food and clothing to the children of orphanages, homeless people and to all those in need. La “Together In God’s Family Care Foundation” si è impegnata nelle attività per il sociale, quali distribuzione di quaderni su cui scrivere per gli alunni delle scuole in un villaggio e nelle città Nigeriane; sostegno economico delle donne in gravidanza, le quali non potevano permettersi l’assistenza sanitaria, in quanto in molti Paesi dell’Africa la Sanità è privata; donazione di alimenti e vestiti ai bambini degli orfanotrofi, ai senza tetto e a tutti coloro che più sono in difficoltà. 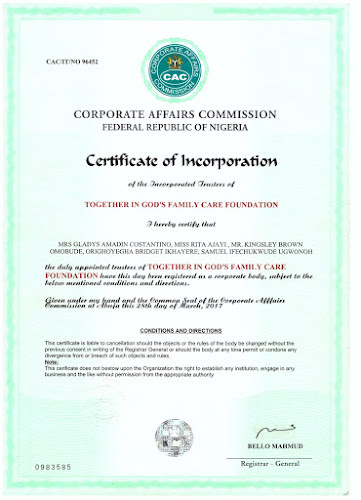 The "Together In God's Family Care Foundation" was born on January 17th 2017, founded by the President (CEO) Gladys Amadin. 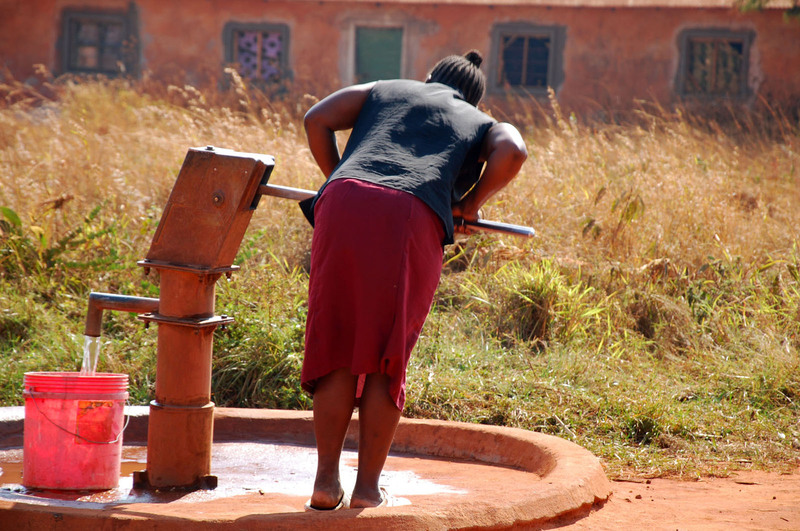 It is an association that defines itself as a non-profit organization of social utility (Onlus). The association pursues aims of solidarity, charity and education, born mainly in support of Nigeria, but it is not our intention to limit ourselves to this, in fact it is also aimed at all of Africa. Our main objective is to give charity to solve the concrete problems and to improve the living conditions for the less privileged. We want the "TIGFCF" to be open to everyone and that anyone can contribute, as it is together that great things are created.